Batman, Superman and Power Girl are all superheroes with distinctive costumes, and all of their costumes include capes. Capes add a dramatic dash of flair to a costume, and if you are putting together a superhero costume for yourself or for your child, it helps create a distinctive look. 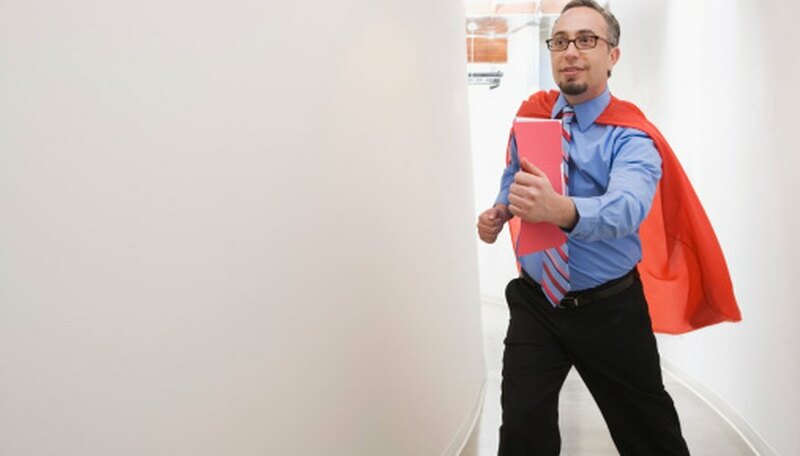 Make your superhero cape long and flowing so that it can swirl behind you as you walk. Measure the distance from shoulder to the other. Measure the distance from one wrist to the other. Measure the distance from your shoulder down to the back of your knees. Mark out a trapezoid on a piece of fabric using the measurements from shoulder to shoulder and from wrist to wrist as the parallel lines, and the measurement from your shoulder down to your knees as the height of the trapezoid. Cut out the trapezoid using a pair of scissors. Cut a slight curve in the shortest side of the trapezoid. This is where your neckline is. Hem the cape by turning the ends down twice and sewing them flat with needle and thread. Attach the cape to the rest of the costume by securing either side of the neckline with a pair of matching costume jewelry brooches. Paint a design in fabric paint on the back of the cape for some visual variety.